What is the difference between a brick oven and a refractory oven? Why 850 and 1000mm round? Why is the flue at the front? Why a stainless steel flue? Do you need a temperature gauge? How many pizzas can I cook at a time? Can I cook pizzas straight on the floor? How often do you have to remove the ashes? How often do you use the door? What utensils do I need? 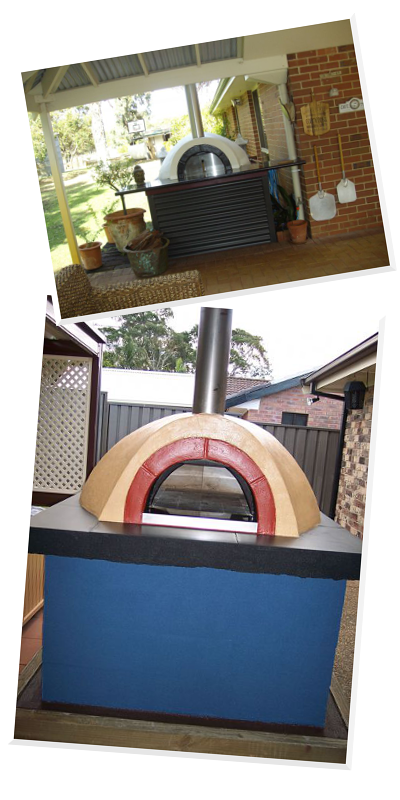 Though many companies have started importing cheap ovens from China, our West Aussie made ovens are not only excellent value, they work exceptionally well too according to our customers. Our gallery page photos and testimonials are all sent in from our clients. Our ovens are in homes, cafes, hotels, restaurants, resorts, stations, on trailers and trolleys and even in vans all over Australia. With over 19 years experience, we mould, cast, vibrate and hand trowell our ovens using the best quality refractory products available. A kit oven is much cheaper than a fully assembled and rendered oven. Being 4 pieces makes it much easier to lift, handle and assemble. A one piece oven could not be lifted manually if it was built out of quality thermal materials which are dense. It's also much easier to work on the inside of the oven if you have a lid. Four pieces also allow for any movement and decreases the chances of cracking. And of course, you get a lot more enjoyment out of something you made yourself. The basic difference is a brick oven or a clay oven can take several hours to heat up, but retains the heat longer. A refractory oven takes from 20 minutes to heat up but the heat needs to maintained by adding firewood occasionally. Generally, we have usually finished cooking in our refractory oven in less time than it took to just heat up our previous brick oven. Heat retention is never an issue in a refractory oven. Why 850mm and 1000mm round? We think the Family one metre internal cooking area is the ideal size for large families, entertaining and commercial use. You can cook several pizzas at once, or 3 roasting dishes in the Family oven, which is ideal if you want to cook your entrees or pizzas while the roast and vegies are cooking. The 850mm round Napoli is ideal for the average family and still fits 2-3 medium pizzas or 2 roasting dishes. Both ovens are much larger than the imported ones sold in hardware shops. A dome shape allows the heat to circulate more efficiently. It also provides a wide cooking face. With a long or narrow oven, you have to constantly reach over the front dishes to get to the back dishes. The flue is at the front outside the cooking chamber so the heat circulates within the dome and must pass over the food to escape. If the flue is inside the cooking chamber, the heat will just escape up the flue. Tin or galvanised flues will rust and deteriorate quickly from the extreme heat, the weather and the reaction to the render. No, you can tell the temp several ways quite easily ( it's in our user guide), but after a few times, you just get a feel for the temp. The large Family oven can fit about 5 pizzas, but that amount is difficult to manage unless you are a professional. We cook a maximim of three at a time and since they cook in less than three minutes, that's about 60 pizzas in an hour.How many pizzas can you make or eat in an hour? (Teenagers excepted). The medium Napoli can fit 2-3 medium pizzas or 2 roasting trays. Yes, we always cook our pizzas on the floor! Our fire bricks have a non hazardous insulating blanket underneath to trap and rebound the heat. Our ovens are also designed with a low ceiling to force the heat onto the floor. Ovens with a high ceiling take longer to heat, longer to cook and use more firewood. The large Family oven kit weighs approx 320 kilos. Allow about 200 kilos for the render weight and a concrete slab can weigh about 200 kilos. Weight does not define efficiency, it's the quality of the thermal materials and the design that makes an oven work. The Naploi kit is about 70 kilos lighter. The ovens imported from China are made from a very heavy but inferior material. Yes, our clients are always commenting on how easy they are to put together. Allow about two hours to assemble and about 3 hours to render. A CD with step by step photos is included, plus you can call us anytime, 7 days, if you have a query. You can also see our installation video on this page. Because the ovens burn so efficiently and we recommend a hardwood for the fire, there is very little ash left. You may need to remove the ashes about once a year. We have not needed to remove any ashes from our ovens for several years. Our oven doesn't need the door on to keep the heat in. We mainly use it to keep the weather out when we are not using the oven, plus we use it at the end of the evening when we throw the camp oven in for slow cooked roasts, casseroles, curries etc. Temperature gauges on doors only give an approximate guide to the temp near the front of the oven. It is easy to tell the temp of the oven after a few firings. We supply an aluminium pizza peel, a wooden fire rake and a wooden/natural fibre hearth brush. You can purchase expensive metal tools, but they can chip the oven and get too hot to handle. Though they do look good hanging on the wall behind the oven! Is the render supplied? No, it is not practical to ship half a trailer load of sand and cement. You only need to allow about $50.00 for brickies sand and cement. No other additives are required in the render.